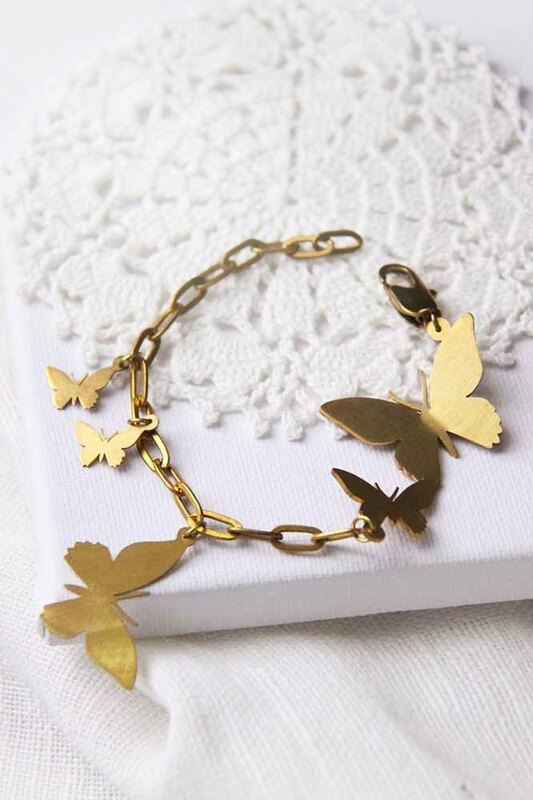 Brass Butterflies / Golden Butterflies / Linen Jewelry / Everyday Jewelry / Chain Bracelet. Brass Butterflies / Golden Butterflies / Linen Jewelry / Everyday Jewelry / Chain Bracelet. Unique and handcrafted jewelry from Linen Jewelry Collection. Jewelry Details: - Approximate big butterfly size: 2.8x2.1 cm. small butterfly: 1.4x1.0 cm. - Bangle free size - Weight: 11 g. - Jewelry comes in a cute brand bag. - High Quality Standards SHIPPING: - We will ship out the order within 1-3 business days once received order and payment. - Shipping to Worldwide from Thailand by Registered Airmail. Shipping usually takes 2-4 weeks to arrive in most countries. - Once orders are shipped out you can find tracking information through your etsy order. ****100% Guarantee's Your Order ons**** the Just contact Middle us Identification You Have Any question Forward At All the if the manufacturing / production methods thailand.